My mom and I have this awesome deal going on while we live in their house. She hates to cook and I don't like dealing with whiny children while I am making dinner. So, while I make dinner for my family and my mom and dad, she takes the boys on walks or plays with them outside so I can cook in peace. The boys love it too so it's a win-win-win all around! It is basically heaven and I'm already dreading the end of this perfect arrangement when they go on their mission this fall. The other night my brother and his wife were coming over for dinner and I didn't know what I was going to make until my mom came home with a couple of big fillets of salmon. Now, let me vent here about fresh fish for a moment. I'm all about using frozen chicken, frozen ground beef, frozen turkey, frozen shrimp and frozen other various cuts of beef but when it comes to fish - there's just no comparing fresh vs. frozen. It is just infinitely better when it's fresh and that was just reaffirmed the other night when I made this meal. I started out with this recipe by Gwyneth (cause she's my fave) and then I modified this recipe for the salad and it was a delightful meal. I recommend it (obviously or else I wouldn't be putting it here on the ol' blog) and I think everyone else at the dinner table would too. Plus, it was really easy and fast and who doesn't want that?? P.S. Sorry about the lame photo - my camera broke so I had to use my iPhone. Heat oven to 425°. In a bowl, whisk together juice, zest, maple syrup, sriracha and salt. Place salmon on a cookie sheet lined with a large piece of aluminum foil. Pour lime-maple mixture over top. Loosely wrap foil around salmon and roast until cooked through and flaky - about 15 minutes. 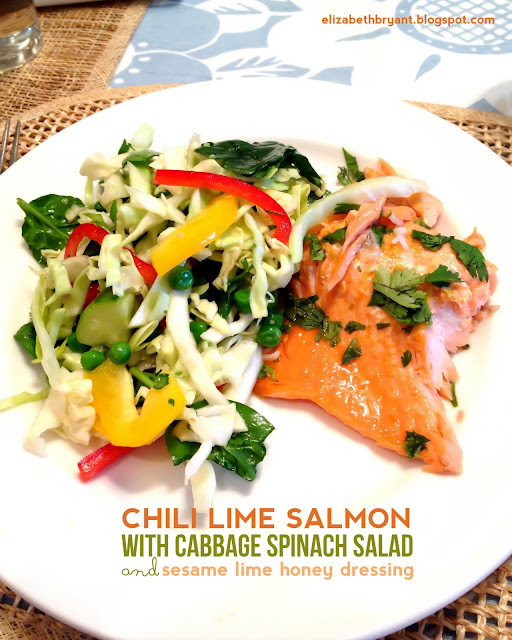 Sprinkle with cilantro and serve with cabbage spinach salad (recipe below). Cook the peas according to directions. Drain and let cool slightly. Combine cabbage, spinach, peas, bell peppers, cucumbers and green onions in a large bowl. Toss to combine. Cover and chill while you make the dressing. Whisk the chili sauce, honey, oil, vinegar, lime juice, soy sauce and wasabi paste until well mixed. Pour dressing over salad and toss well (optional: serve with crushed peanuts on top). Place all ingredients (except the cornstarch/water mixture) in a sauce pan or pot. Bring to a rolling boil. Reduce heat to medium and let boil for 10 minutes, or until reduced by half (it will be really strong smelling at this point but don't freak out). Reduce heat to low and add the cornstarch/water mixture. Stir to incorporate and continue stirring occasionally until the sauce thickens for about 2 minutes. Remove from heat and set aside to cool before using. OH my goodness gracious me... does that ever look amazing. I think I know what I'm having for meatless friday!! THANK YOU for sharing! Ok couple of things... First, I miss you guys, second, love the new car, I'm jealous, third, what do you mean by fresh? At one time the salmon was frozen by whoever caught it, not assuming your mom was in Alaska catching that morning :), so do you mean it's better if its flash frozen on site caught, then not refrozen for packaging purposes? I always assume all fish is frozen? Then they thaw for the display case? How do I get the good stuff, what should I look for? And finally, about that dove video, it is truly good stuff, but I don't like it how you put yourself down, you are one of the most beautiful women I have ever met, inside and out, it's time you knew it! You should be watching that video thinking its sad those women feel that way about themselves I'm glad I've been helping women like that, not relate so much, you're not that girl, you're so much more. that looks so delicious! and i couldn't even tell that it was not a camera photo! :) will you be able to fix it before you travel? and a side-note: i see you also love fonts, like i do ;) have you seen my font-folder on pinterest? Looks deeeeelish! I wish Sean liked Salmon. He's a white fish kinda man. I can't believe that's an iPhone picture. I was about to comment on how clear and crisp it is. Well played little iPhone, well played. Love you wots and wots! !